A few years ago, we were invited to The World Of Concrete is Las Vegas as featured Artisans to showcase our Rustic Concrete Wood System. Ever since, many have attempted to copy the look. Our proven techniques and staining methods are what makes the “Original” better than all others. One of the highest profit per square foot finishes that we teach, this system alone can generate plenty of excitement for potential clients in your area! If you’re looking for an attention grabber for your business, nothing compares to sharing a few concrete wood pictures on social media…we’ve have millions of views on some of our concrete wood videos and photos! In our Rustic Concrete Wood Course you will learn how to create this beautiful system from start to finish! 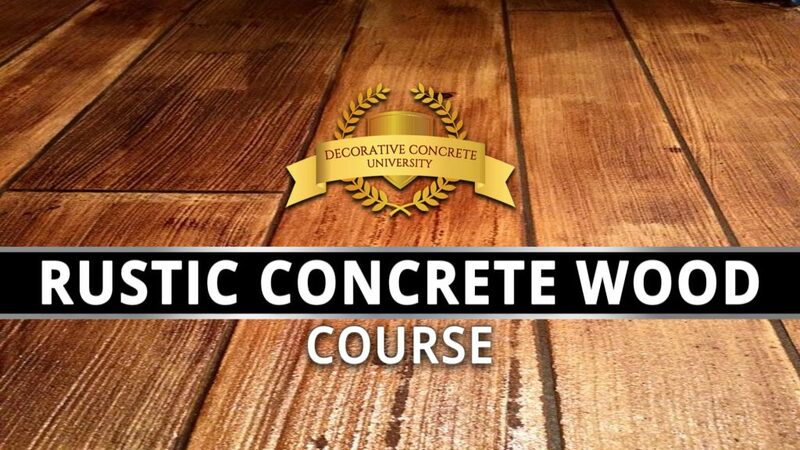 Watch the award winning decorative coating system Rustic Concrete Wood from start to finish. Properly Mixing the Grout Coat will give you the desired look of the Grout Lines separating the boards.